The entire SSE Arena in London seems poised above us; an immense sphere of mythological darkness, something dreamed, something imagined. The cheering of the audience on the other side of the flimsy curtain is like the howling of a high wind. Peter Graham stands erect, bouncing from side to side, bearing the whole thing on his shoulders as if he is its very axis. Pete is the definition of a mixed martial artist. Beginning in full-contact karate, he ascended to the highest echelons of international competition before shifting to kickboxing. He finished his amateur career undefeated and continued to dismantle opponents until his first decision loss was handed to him after twelve rounds by the world’s most famous kickboxer, Stan ‘The Man’ Longinides. Peter continued to fight in Japan, becoming one of the best-known fighters in the Japanese-run international kickboxing grand prix, the K1. He fought – and defeated – almost all of that organization’s heavy hitters. With the ascendancy of mixed martial arts, he moved to Brazil to undertake a study of Brazilian Jiu Jitsu. He chose to eschew the UFC with their low purses and restrictive contracts and has fought under boxing, kickboxing and mixed martial arts rules in Japan, the US, Europe and Australia. After two decades and more than one hundred fights, he has decided it’s time to hang up the gloves. And, as with almost every outstanding Australian combat athlete, he’s virtually unknown at home. The gate at the back of the arena is open. Lighting rigs and scaffolding are strewn around the space, creating obstacles and walkways. The little light that finds its way in from the parking lot bounces off and is baffled by trucks. The backstage area is filled with itinerant road cases, denser, blacker shapes in the dark. The icy English wind sneaks through and insinuates itself between your ribs. Larry Papadopoulos, Pete’s trainer and one of Australia’s first MMA fighters, hands me a set of latex gloves. I pull them on. It takes a few attempts to get my fingers in properly. A powdery streak of light catches the back of my hand and then disappears. The announcer makes the intro and Pete hears his name. He pushes through the split in the curtain, the flimsy line between present and future. The roaring surges; the lights are blinding. The last time I saw Peter Graham was five months ago, in Poland, for KSW 31. 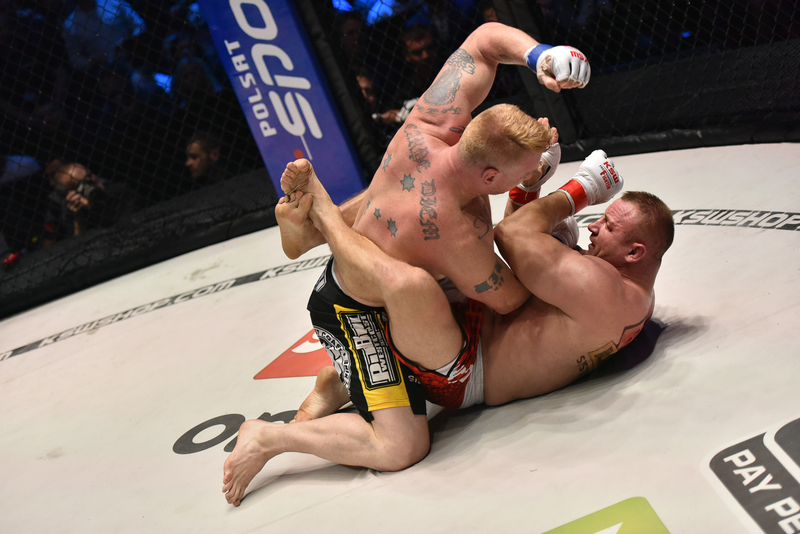 He was slated to fight the KSW heavyweight champion, Karol Bedorf. Standing 6’3” and weighing around 120kgs, Bedorf had not been beaten in three and a half years. I’d never been to a fight show in Eastern Europe; KSW 31 was instructive. A Polish promotion, KSW is the largest promoter in Europe. It was at the press conference that I met Mariusz Pudzianowski for the first time. A bird’s-eye view of Warsaw is characteristic of Poland generally; while the country is moving into a democratic future, its communist past is only a few steps behind. Beside the undulating sea-green sheets of glass that comprise the appropriately named ‘Modern Building’ stands Stalin’s gift to the people of Poland, ‘The Palace of Science and Culture.’ It looks like a cuckoo clock made of duplo. Inside, it is a series of pristine marble halls lit by peculiar communist art-deco chandeliers. The main hall, set up for the press conference, was presided over by three looming vertical banners that bore the larger-than-life images of the current KSW champions at light, middle and heavyweight. Mariusz Pudzianowski was also larger than life. A fan-favorite, he enjoys a degree of notoriety amongst fans of manly sports; he won the title of World’s Strongest Man five times, listed by the Guinness Book of Records as the most victories by anyone in the history of the event. He also featured on the Polish edition of Dancing with the Stars, finishing as runner-up. In person, the man can only be described as monolithic. He stood at six feet, carting around one hundred and forty kilograms of muscle mass. He reminded me of the Golem, the monster from Jewish folklore that featured in the 1920s black and white film of the same name, complete with scintillating, ice-blue eyes. That night Pete went into the change rooms beneath the Ergo Arena in Sopot, Poland, while I ascended into the nosebleed seats allocated to media. Pudzianowski put away his opponent with a one-punch knockout mere seconds into the first round, while Pete underwent a grueling competition on his back against a fighter smart enough to know that he’d lose his title if he got caught standing. Next time we were all together would be in London, England, and Pete and Pudz would be coming to grips with one other. Walking into an empty venue during a sound and light check is a bizarre experience. Without bodies to absorb the light and sound, everything ricochets and expands and creates the sensation that you can hear the cavernous emptiness itself; it’s a white-noise nothingness on a sub-audible frequency that becomes a hard ball and swells in your stomach like a seed. The dressing-rooms beneath the SSE Arena in London, no matter how air-conditioned and comfortably appointed, are unpleasant places. No windows and no décor, they aren’t designed for settling. They place an unspoken emphasis on the waiting. Pete parks himself on the couch and shuts his eyes. Larry hooks a theraband onto the coat rack and begins doing some rehab work on his shoulder. “I’ve got a one centimeter tear in the meniscus and it’s driving me mad,” he says. Larry, proprietor of Boxing Works in Sydney City, also works as the wrestling coach for the Sydney Roosters rugby team. We are sharing the rooms with a Brazilian fighter named Maiqual Falcao. His corner started his warm up early, which to us, looks more like a sparring session. “I believe that some fighters need their first round in the dressing rooms,” says Pete, settling back onto the couch and putting his feet up, “But that’s a lot of work.” It’s also a lot of noise and movement, which comes as a welcome distraction. The corridor outside is bustling with officials, fighters, production staff and security. Pudzian’s room is at the opposite end of the hall; occasionally, the white and red of his team t-shirt is seen moving past our doorway. The surge and roar of the crowd sounds like the seething of the ocean. The fights are finishing quickly, with lots of knockouts and submissions. One of the advantages of being the main event is that people are inclined to come to you. While Pete had already visited the ring doctor on arrival, he pushes his way in, slightly alarmed by the guys working out on the jigsaw mats in the corner. “I fought a couple of months ago. A boxing fight.” Peter contested the Australian heavyweight boxing title against promising young heavyweight, ‘Bangin’ Ben Edwards. The usher appears in the doorway and calls Maquial’s name. His team coalesces around him and they file out into the corridor. The emptiness of the dressing room pushes Peter, Larry and I closer together. I sit quietly, waiting for instructions. Just as all fighters fight for different reasons, all fighters handle the ordeal differently. All athletes, all performers experience stress before an event, but for a fighter, it’s a different affair. There’s a primal expectation of the fact that another man will take the ultimate measure of you, and that entails injury and violence. I’ve been through it myself and the men who wait with you are part of what is a serious undertaking. When you’ve been entrusted with that responsibility, it is incumbent on you to sit down, shut up and do what you’re called on to do. The crowd surges; another quick finish. Maiqual comes back shortly after, his cornerman carrying an oversized trophy. “Knockout!” says his trainer, in English. “Nice one, son!” I say, and reach out to gently shake his hand. “Thank you,” he says, enclosing my hand in both of his, gloves still on. His grip is as gentle as his voice. Simon Haslam, the cutman returns to cut Maiqual’s gloves off. Once Maiqual is free, he showers and he and his team are gone, leaving us alone. “Can you go out and get a time estimate of when Peter’s fighting? Larry asks. I went out into the corridor and headed for the entrance to the arena. Pudzian is pacing the corridor. He doesn’t know me, but from the look on his face, he can read English: ‘Peter Graham – Australia’s Greatest Fighter’ is emblazoned across my t-shirt. The beam of his eyeline eclipses mine and as we pass each other, I have to turn side-on to avoid bumping shoulders. When I return, Simon and Peter are sitting on two separate chairs, back to front. A guy in fight shorts and a t-shirt that reads ‘London Shootfighters’ sits against the wall, fiddling with his phone. Pete supports his arm on the chair back while Simon does his work. He’s a cheery fellow, who also wraps hands and works as a cut-man for the UFC when they are in town. “Forty-five minutes,” I say, and Larry nods. “My dad was a local doctor, and had also been a boxer, too,” says Simon, as he attaches a strip of tape to the back of Pete’s hand and winds it between his fingers. The bandages provided by KSW are short, and Simon has to supplement them with things from his own kit. “How is that?” Simon asks Peter. He lifts his hand, opens and closes his fingers and nods. Larry hangs the gloves on the coat rack, left and right on either side. “Good luck, boys,” Simon says, picks up his kit box and leaves. An usher leans in the door. “Fifteen minutes,” he says. “I’ll be ready,” says Pete, rising from his chair and beckoning to the guy in the Shootfighters shirt. They lock on and start wrestling. “Jarrod, can you go fill these bags, and put a bit of ice in the bottom of the bucket?” asks Larry. There are two large wheelie-bins full of ice out the back, near the door. I fill the bags and fetch the ice and when I come return, I find Pudzianowski prowling the hall once again. We are even closer this time, and his shoulder grazes my stomach as I pass. Peter enters the stadium through the curtain; Larry and me are led into the arena through a separate entry, along the side. The cage itself sits dead-center in a halo of white-hot light. Pete crosses the threshold and Larry and I stand behind him, on the other side of the wire. The light is so bright, it occurs to me that there are no shadows. In Poland, Pudz weighed in at around one hundred and forty kilograms. He had slimmed down to a svelte hundred and twenty for tonight. His back is still wide enough to land a plane on. If there is another set of shoulders big enough for the main event to rest on, they were his. The referee gives his instructions, everyone else files out of the cage and the door is locked. The bell goes and the two men make their way towards one another. In Poland, Pudz came across the cage, roaring like a bull. This time, he’s a little more circumspect. Both men close to striking distance and while Pete tags Pudz with a few inside thigh kicks, neither combatant finds any real purchase. Pudzianowki shoots in and takes Peter down. All that truck-pulling is clearly visible in Pudzian’s drive; both bodies crash into the fence, sending the kind of reverberations through the canvas platform you’d expect to experience at the Volkswagen crash test zone. Pudz plants his weight on Peter’s chest and props a forearm under his chin, trying to iron his body out straight while Pete locks his legs around Pudz to establish full guard. With neither fighter scoring, the referee chooses to stand them up. Pudzian goes for another takedown and Peter times his sprawl better this time, stymieing the attempt. Pudzian slips, Pete leaps down on top and lands a punch as Pudz attempts to cover up. The bell rings and the referee dives in between them. Standing, Pete touches the blood on his brow, trying to discern whom it belongs to. Pudzianowski stays on his back, sucking air like a broken bellows. The round break elapses quickly. The gate opens and Larry and me enter the enclosure. I hand Larry a bag of ice and reach for Pete’s mouthguard. Anything said is strictly between them; the maelstrom of the crowd sweeps it away. I look across the cage. No-one in Pudzian’s team is speaking; the man is piled onto his stool like luggage. ‘SECONDS OUT!’ comes the instruction. Larry and me squat outside the fence at canvas-level as Pete comes forward, poised for the strike. Pudzian stands flat-footed, continuing to heave. Everyone in the SSE Arena senses the moment is nigh. Pete begins to find his mark with a succession of punches and Pudzian desperately dives in for a takedown to escape the blows. As Pudzian crashes forward, Pete comes down on top, mounts his chest and continues the onslaught. Without answer, Pudzian covers his face and rolls away. The referee intervenes and waves off the fight. Larry and I follow Pete back to the change rooms, behind a mob of security and cameras. When the door slams shut behind us, Pete lays down on the floor face-first. His wife, Sylvia, sits at the head-end while Larry stacks bags of ice on his back. I kneel beside him, kneading his forearms. “He was trying to cook your arms up against the cage,” says Larry. “It was bad enough hanging on,” says Pete. After a shower, Peter heads down the corridor to do some interviews. Fortunately, most of the marks on his face are on the side facing away from camera. Looking like a lantern-jawed version of the Bonds man Peter is urbane and articulate, displaying the years of media training he received courtesy of the K1. After a few jokes about having the world’s strongest man laying on top of him, the interviewer starts talking about prospective opponents. In elite fighting circles, the name ‘Fedor’ is like Mephistopheles. The most dominant fighter in the history of mixed martial arts, the Russian heavyweight’s winning streak ran for a decade. It looks like we might be ringing in the New Year in Japan, after all. This entry was posted on December 4, 2015 at 10:52 pm and is filed under K1, Kickboxing, KSW, MMA, Peter Graham, Real Men with tags Boxing Works, Dancing with the Stars, Fedor Emelianenko, Golem, Japan, K1, Karol Bedorf, Kickboxing, Larry Papadopoulos, Maiqual Falcao, Mariusz Pudzianowski, mixed martial arts, Royce Gracie, Simon Haslam, SSE Arena, Stan 'The Man' Longinides, UFC. You can follow any responses to this entry through the RSS 2.0 feed. You can leave a response, or trackback from your own site.